The GeraFold 212 is a new amazing wide format offline folder realized to optimize the user’s job who must fold the wide format drawing easily and with a low cost. The paper folder machine is able to fold any technical drawing perfectly to any worldwide fold standard. Able to fold also A4/A letter size into 3 panels for mailing or advertise documents or A3/B size brochures into 2 or 3 panels. This offline folding machine sets a new benchmark in the automatic folding machine market, adding functionality as fold length capability unlimited as first fold and up to double A0 thikness as second fold process. The Gerafold 212 large format folder is able to process letter A4 or A size and is capable to fold heavy double colour brochures and maps. Manual cutting device for trimming documents (optional for GeraFold 218 standard for GeraFold 218cut). 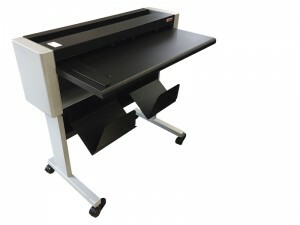 The wide format folder thanks its innovative design does not add space to printer footprint and defines a new benchmark. The fold machine allows to lower the costs significantly by eliminating the laborious and costly finishing operations as manual trimming and folding, with a simple click you will have your copy ready for distribution fulfilling the work peaks. The GERA Butterfly Extra paper fold machine is part of the system with the printer HP Designjet T7100 , scanner SD36 and the software Reprocontrol. 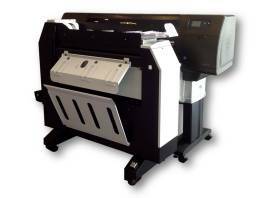 The GERA Butterfly EXTRA II introduce patent technology able to synchronize folder speed to the variable print speed and able to dry instantly ink drops before the fold process; these weakness on other solutions are source of jam and frequent error. The ease of use thanks the full integration with the printer controller enable users remotely to select fold feature and get folder status at any time. The limited floor spaces requirements, the extremely silent operation, the wide fold capability and reliability define this the best solution available in the market to handle large print jobs and improve the efficiency of the press centre.